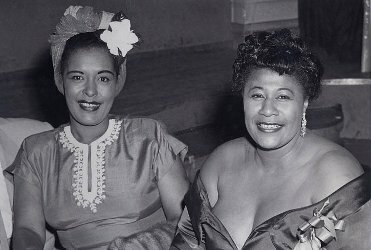 Italian perfumer Maria Candida Gentile takes an entirely different approach, and if I can't really connect the smell with what I know of Billie Holiday, that's neither here nor there I suppose, and we're always happy to have an excuse to post another image: she is shown here with The First Lady of Song, Ella Fitzgerald (who for mysterious reasons never seems to get a perfume named after her). Lady Day starts green. It's momentarily soft, then the green expands and gets spicy and sharp, and this big, almost-bitter spiky green is really the only big part of the proceedings; it calms after a bit, and then the whole thing is dewy soft from there on in. The gardenia comes on slowly and never raises its voice above a whisper, nor does it entirely emerge from the dewy green haze left over from the opening. It is not heady; there are no undertones of decay or mushrooms — it smells like gardenia, yes, but not like the fresh cut flower and not like most gardenia perfumes.4 The amber-y woody base is likewise mild and pale, and it's in Extrait, so it stays relatively close to the skin. 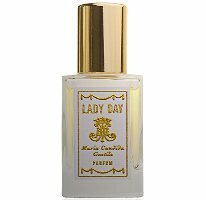 Maria Candida Gentile Lady Day is in the brand's Exclusive collection. It is available in 7 (€22), 15 ($56) or 30 ml ($165) Parfum. For buying information, see the listing for Maria Candida Gentile under Perfume Houses. 1. At some point, I understood you could still buy Lady Day from the Strange Invisible Perfumes boutique in California; I've no idea if that is true now. 2. "Rumour has it that Holiday burned her hair with curling tongs one evening, just before she was due to take the stage. One of her fellow performers remembered that a neighbouring venue sold flowers at the cloakroom, so she nipped off and came back brandishing a bunch of the white blooms, which Holiday then pinned in her hair. Holiday liked her emergency hair cover-up so much that from then on, she would be rarely seen on-stage sans gardenia." (via Beauty Flashback: Billie Holiday's flower-filled hair at The Telegraph. 3. I used the term 'oddball', but in all truth I hardly remember Une Voix Noire so I'm taking Kevin's word for it. All I remember is that I disliked it enough that I never got around to trying it a second time. 4. I should point out that Lady Day reportedly uses a natural gardenia absolute, whereas most gardenia notes in perfume are accords, gardenia absolute being somewhat rare and expensive. Also, though, it’s paralyzing to go so long. I do think I *could* buy something in January, but what?? It would be hard to pick that one single thing that is worth breaking a 1 year run. It’s no longer “forbidden fruit”. Just read your review of the SIP scent, and that’s the type of Lady Day I’d want: gardenia intensive. I do like galbanum, but would rather have a galbanum-tinged gardenia than the reverse. I couldn’t bear Une Voix Noire–the booze/berry/tobacco combo nearly suffocated me. Props to this brand for offering an array of smaller bottle options! The SIP was really expensive though, which is why I never bought it. This one – it is better to my mind, since I also love “gardenia intensive”, to approach as a green floral than as something that will scratch that particular itch. I kinda want to buy now just because they offer a 7 ml option! This should be rewarded. Yeah. Most unfortunately I don’t think that gets distributed (someone correct me if I’m wrong!) so you’ll have to buy direct from MCG. I bought a 15 ml Sideris at Twisted Lily. Not sure if they offer more of this line. Yes — the 15 ml come here, but I think not the 7. Also think the 7 ml are only done in the Exclusive collection, but not sure. Couldn’t stand Une Voix Noire – wilting gardenia dragged through some caramel syrup and leftover tacos and then dumped into a full ashtray? No, thanks, Oncle Serge. Nassssty. This sounds really lovely. You know I dig me some spiky-bitter green stuff. (Well, not Bandit. But floral bitter spiky green, that I love.) And soft gardenia, yes. D*** it, must add to the test list. And Ella *definitely* needs a perfume named after her. But then, she needed and deserved a good moniker too. LOL at leftover tacos!! I really don’t remember it that well, just that I didn’t like it and thought Kevin was right. Love the review, and interestingly enough, I finally broke down recently and ordered some MCG samples so I’ve been sampling the line. They are interesting, and seem well-done, but so far nothing has made me whip out the credit card. And now I *really* want an Ella Fitzgerald perfume! If ever a celeb deserved one, and a good one, it is Ella! What notes do you, Robin, and/or NST readers envision for her? Hey, did you get Barry Lyndon? That’s the one I still have on my list to get my hands on because so many people said it was great. Would love to know what perfume Ella wore. I picture her in something expansive and happy like Joy, because she always sounds like she’s just plain happy to be singing, even when she’s doing a sad song. And I would be too, if I had that voice. So, a full on floral. What would you pick? I’ve just spent the last 1/2 hour on that celebrity scent site, which was a blast, but alas no Ella. Joy would be perfect, but I could also see something like either Vol de Nuit or L’Heure Bleue, both floral but with just a touch of noir. No, haven’t tried the Barry Lyndon, now of course I’ll have to order it. So far Cinabre (rose went very soapy – I was disappointed as otherwise I really liked it), Exultat (need to try again), Finisterre (not for me), and still have Noir Tropical (is that the name?) to try. My favorites so far are Sideris & Hanbury. Gentile is quite nice too, a men’s, I need to spend more time with it. I love this line for creating some wonderful perfumes with a good portion of natural ingredients that thrill my nose and for offering small bottles. Plus I like those those labels! (You can’t tell from the photo, of course, but they are a heavy, matte paper embossed in gold.) I will definitely try to sample Lady Day. One odd thing: when I first got Exultat and Sideris, I loved Exultat and was wasn’t sure about Sideris. Now I like Sideris much better. I wonder if the blend might have matured in the bottle. I ordered directly from MCG when I first read the review of Exultat on Grain de Musc, before the line was available here, so it might have been very fresh. Or maybe it was just the usual vagaries of weather, perception, etc. They both have beautiful incense and resins. Oh, nice to hear the bottles are lovely in person. And agree, so nice to see such a friendly range of sizes. And how interesting — I liked Sideris better too so maybe my sample of Exultat was likewise not “fresh”. The bottles themselves are simple but nice enough, the labels are attractively old-fashioned, and the hues of the colored labels are great. There is a sense of the perfumer’s Italian personality, as there is with Hilde Soliani. One more thing I appreciate about this line. Sounds lovely. I was wearing some vintage Miss Dior and was really sad that galbanum is sort of a rarity these days. Maybe we should have a Galbanum Poll to see what modern ones we/I can try! Yes! Galbanum is one of my favourite notes, Chanel No 19 and Miss Dior always being front and centre for me. But I don’t associate it with modern perfumery at all. It is rare these days, what a shame. Miller Harris Fleur de Matin and the updated Silences Eau de Parfum Sublime are the only relatively recent fragrances I can think of that use it. Gobin Daude Sous Le Buis! But discontinued so I guess hardly counts. Chanel’s no 19 Poudre opens with a lovely albeit short-lived hit of galbanum. Now I’m curious about Sacre du Printemps by Ys-Uzac (2014) – galbanum, black currant, vetiver, guaiac wood, and angelica are listed notes. I like Pohadka very much. Or maybe not – it’s 380 euros on the Ys Uzac website.